I’ve had this book on my shelf for a long time, wanting to read it but thinking it might be hard work. Seven Viking Romances, translated by Hermann Pálsson and Paul Edwards, is a collection of Viking adventure stories. 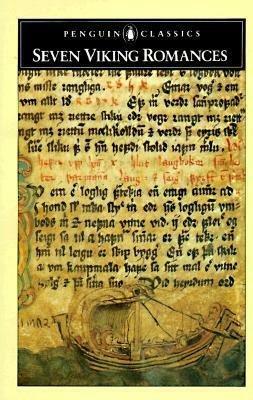 These tales are less serious than the Icelandic Sagas and have many more fantastical elements. There are seven stories, drawn from several centuries, with a common theme of raiding, pillaging and theft. This book was an easier read than I thought it would be, in large part because the stories are meant to be entertaining and funny. They are essentially episodes of sailing around the world looking for notable warriors to kill and treasure to steal. For dramatic effect, once or twice the protagonists of the stories fail to kill the notable warrior. When that happens they either join forces with him or run away and come back later. I was wrong to think that this would be heavy-going. It’s actually delightful and there were parts that made me laugh out loud. These stories don’t explore the ideas of right and wrong or offer a deep psychological insight into the motivations of the characters, or try to educate the listener/reader about the world. They are just entertaining tales from another time and place.